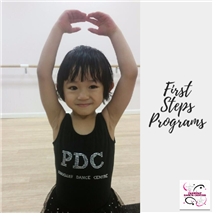 Dance classes for ages 3 - 5 years! Join us for our next 8 week session! New Session BEGINS April 5th Enroll Today! Does your daughter love everything pink and sparkly? Loves to Twirl, Leap and Turn? Then, she will surely enjoy Our Tutus and Tiaras Dance Program.. Imagine her leaping out of the classroom excited to share with you what she learned. And more importantly tell you how much fun she had! Tutus and Tiaras introduces ages 3 - 5 to Classical Ballet and low impact tumbling. Through fun music and stimulating props, your child will learn basic ballet positions and simple ballet vocabulary. Fun acrobatic skills are included in the 8 weeks. Not sure if your child will enjoy ballet? Our 8 week program is a great start ! No recital participation. Try Dance without a huge Commitment!